High fluctuation rates in companies and ever faster changing job profiles require efficient options for managing planned positions. With rexx Position Chart you can manage your planned positions, your position descriptions and staffing situation, and get support for filling vacant positions or during reorganisation measures. Document your positions with all the necessary information and ensure a comprehensive representation of the staffing situation through the software. You assign the type and the number of each planned position individually to the units through the integrated rexx Orgatree. Simply position the employee by drag-and-drop on the vacant planned position. rexx Position Chart also supports partial or double assignments. 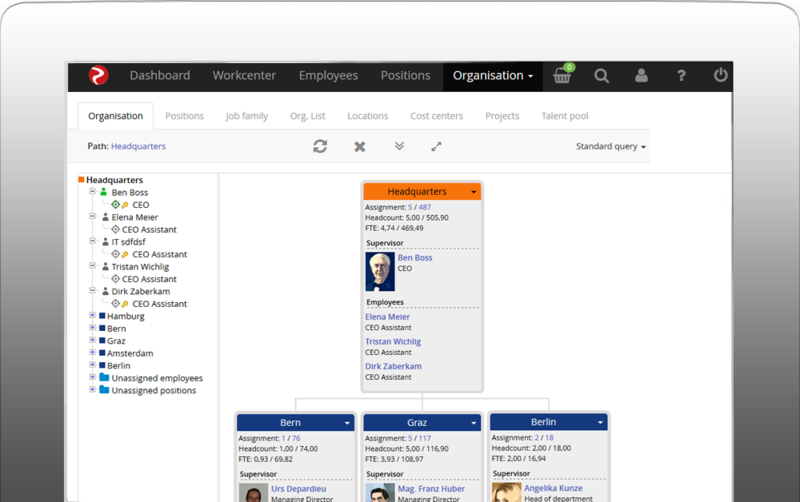 The position chart is not just graphically visualised in rexx Orgtree but is also available as a clearly laid-out list. 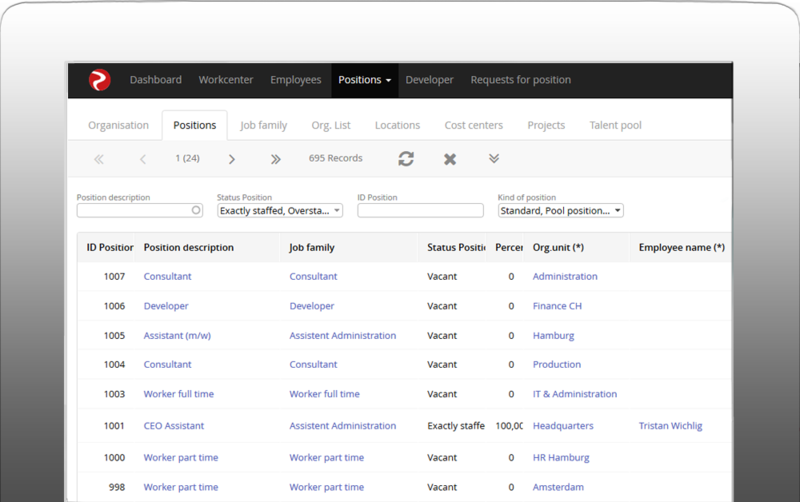 The staffing list displays all planned positions – including staffing level and organisation affiliation. Numerous sorting and filter functions quickly provide a clear overview of the unoccupied planned positions and vacancies. The orgtree is transformed into an organisation chart with a click and can be simply printed out or exported as a PDF file – in its entirety or just a part. In conjunction with rexx Skill Management, you can assign one or several skill schemas and required competencies to a planned position. This allows you to make a comparison between the skills required of an employee and those he or she actually possesses. rexx Org Management supports any number of parallel position charts with multiple nesting in a highly intuitive interface. When opening the branch, you can find details about the appointed staff member, the match with the job profile, the time of appointment and the possibility of advertising the position, e.g., through rexx Recruiting. You can quickly and easily create new organisational units, define hierarchy levels, assign staff and managers to the units, perform relocations and edit the position chart. Relocations, promotions and other organisational changes are documented automatically in the digital file of the respective employee in the rexx Development Chart. Through the rexx Employee Portal, you can enable managers and also the staff to access the relevant organigrams or position charts via self service.